Our economy pack contains six SofLens 59 contact lenses by Bausch and Lomb and a 400 ml bottle of Laim-Care solution. SofLens59 are hydrogel lenses intended for daily wear with a monthly replacement schedule. 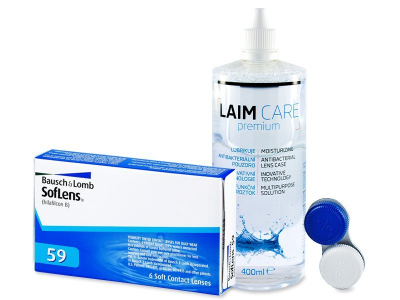 SofLens 59 monthly contacts by Bausch and Lomb are an older type of hydrogel contact lenses for daily wear. Soflens 59 contact lenses contain the hydrogel material known as Hilafilcon B, which allows the lenses to retain sufficient amounts of water to resist deposits and remain comfortable throughout the day. Each box contains six lenses.